Both the F-16 and the MiG-29 were designed to correct mistakes and shortcomings of previous aircraft. With the USAF it was the low kill ratios over Vietnam as well as the lack of complete air superiority over the battle field a feat that was achieved with great success both over the battlefield's of Europe and Korea where the US Army was able to operate under little threat of air attack. With the Russians they wanted an aircraft that would perform the same roles as the MiG-25 and the Su-27 but at a shorter range. As well as an aircraft that for the first time could match Western fighters in ACM, while maintaining the ability to operate as an interceptor. 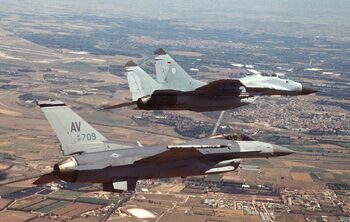 Thus the MiG-29 became a smaller and shorter range F-15 while the F-16 became a larger and longer range F-5. Both teams designed craft that were cleared to operations of 9g and made use of wing-body blending to increase internal volume , reduce weight and improve maneuverability. They both located the intakes close to structures to reduce the AoA (angle of attack) sensed at the face of the intake/s thus increasing the AoA that the aircraft could take in comparison to other aircraft of their day.  With the F-16A the AoA limit is 25deg where as the MiG-29 has been cleared of an AoA of up to 45deg. One of the major differences was in the engine arrangement with the General Dynamics team choosing a single P&W F100 this gave commonality with the F-15 and lower fuel consumption. In contrast the Mikoyan team choose a twin arrangement of the RD-33 with no thought give to using the Saturn/Lyulka AL-31F as used in the Su-27. The reasoning being that the use of two engines gave the aircraft greater survivability as the MiG-23/27's suffered a greater attrition ratio then the MiG-25. With the intakes the GD team adopted a fixed geometry intake as high mach number capability was not required for the role that the F-16 was to fill, while the requirement for a dash speed of mach 2.3+ led Mikoyan to adopt a two dimensional , four shock , variable geometry intake with one fixed ramp and two moving ramps. 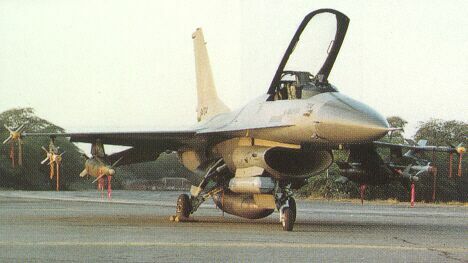 In regard to FOD (foreign object damage) the GD team took the position that FOD would not be a problem as the F-16 would operate form swept, paved runways. Where as the Russians felt that a rough field capability was an important capability and as such devised two movable ramps over the intakes to prevent FOD while on the ground or at low speed at low level. When the intakes are closed the engines breath via auxiliary intakes on the upper surface of the wing. The F-16 has incorporated a number of features that are intended to enhance combat effectiveness. The pilot's seat is inclined at 30deg rather than the normal 13deg , he also has a side stick controller which allows the pilots arm to be supported this has not met with universal approval as some pilots prefer to be able to fly with either hand. The F-16 also for the first time incorporated a Fly-By-Wire flight control system, this allowed the aircraft to be made inherently unstable and would greatly improve maneuverability in air-combat. While the MiG introduced the first HMS (helmet-mounted sight) and IRST (infra-red search and track) sensor with a laser range finder for passive attacks and missile engagements up to 45deg off-borsight but maintained a conventional flight control system and achieved high maneuverability mainly due advanced aerodynamics. i.e. The tail of the MiG-29 is said to have been positioned to take advantage of the four vortices by the wing and fuselage. In combat provided that the MiG-29's 7.5g above 0.85 mach can be avoided it should beat any F-16 due to its BVR capability , higher thrust/weight ratio and lower wing loading. While in recent exercises between USAF F-16 and German MiG-29A's showed that in ACM the greatest advantage the MiG-29 had was it's helmet mounted sight coupled with the AA-11 Archer which gives it a kill zone greater than any aircraft serving. 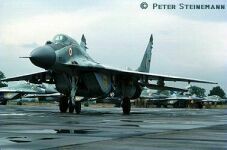 F-16 pilots found that any aircraft within 45deg's of the nose of a MiG-29 was always under grave threat. The ability to target aircraft well of boresight has proved to be such a success that helmet mounted sights have become requirements on any new fighter program. While both aircraft have short-commings those of the MiG-29 have effectively been solved with newer versions ( MiG-29 S/M/K and MiG-33 ) which have increased the fuel capacity of the MiG as well as adding an in-flight refueling system. The number of hard points has also been increased by two and the max warload has been doubled, along with the inclusion of a fly-by-wire flight control system and a new radar that allowed two targets to be engaged simultaneously with the new AA-12 Adder active radar missile as well as full clearance for flight at 9 g's . Most of these upgrades have been offered to current users of the MiG-29 with the Russian and Indian airforces conducting some upgrades. The F-16 by comparison has had few of it's problems solved in the past few years. One of it's greatest drawbacks the lack of a BVR capability was solved with the clearance of the AMRAAM for use on the F-16 but the second major problem of insufficient wing area on the F-16C has never been solved.